If you have a penchant for oysters then I expect Whitstable is already high on your gastro bucket list. This trendy seaside town on the Kent coast has long been a hot spot for Londoners looking for a weekend away without having to stray too far from the comforts of the city, or indeed the convenience of the tube and rail network. In response to the influx of discerning visitors (with equally as discerning palates), Whistable has become rather well-known for its bountiful array of eateries which can rival any found in the city; one or two of which even boast Michelin stars. 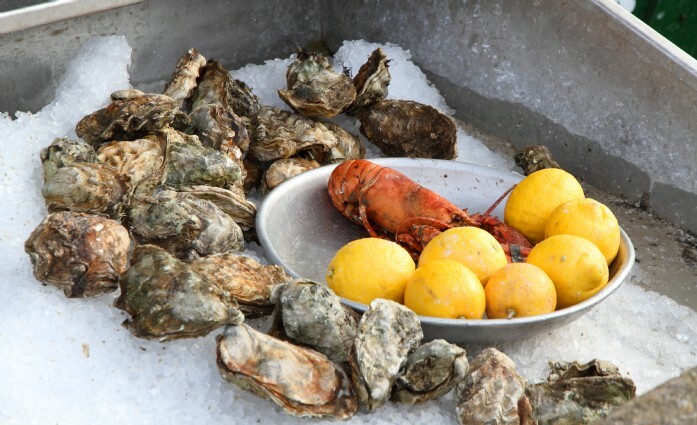 As any mollusc fans will know, the Whitstable oyster festival in July is not the best time for sampling native oysters when the season starts in September. Instead of following the crowds, true oyster fans visit Whitstable in September when the oysters are at their finest, the majority of the crowds have retreated back to London, and the weather is often at its most clement. Seafood lovers in-the-know jostle for a table at the phenomenally popular Wheelers Oyster Bar which has only 14 covers (they also do take out, and is unlicensed so you can take your own plonk), or the Pearson’s Arms where you can shuck ‘til your heart’s content in front of the fire with a glass of Prosecco. Chances are that as you walk off your supper on the beach afterwards, a fisherman will walk past you in his waders bearing the day’s catch- and it doesn’t get fresher than that. If you’d rather see fish in the sea than on your plate, then pay a visit to a charming little rustic bistro right in the heart of town just a few doors up from Wheelers. Samphire specialises in Kentish produce which is carefully sourced from local farms, foragers and gamekeepers and is as popular with locals as it is with the visiting masses. A great choice for a slow brunch with freshly brewed coffee and the weekend papers (and having your booking name written on the table with chalk somehow makes you feel a little bit special). An exploration of Whitstable’s eateries isn’t complete without a cap doff to JoJo’s. As you enter this delicatessen with a difference, locals sit drinking coffee and sampling the mouth-watering offering of pastries, cakes and desserts. If you can resist the delectable aromas wafting from the oven, then you have a stronger will than I. Be alert and move fast; blink and your poppy-seed cake slice will have been bought, bagged and bustled off down the road. And with a flavour that ambrosial, believe me you wouldn’t want to miss out…!